webisodes straight to your inbox! What Is Geofencing and how does it work for mobile apps? Hi, In this week’s episode of Pulsate Academy, I’m going to show you how you can integrate geofencing into your mobile app and how to start engaging customers in the real world. Let’s jump in. You might have seen these location-based alerts pop up on your device, maybe you’re out walking past a retailer, and you receive a push notification prompting you with an incentive. It appears to the app user like they were at the right place and the right time. Do they start to wonder what technology runs behind-the-scenes? You may have heard already heard about how iBeacon works and thought that geofencing possibly needed some kind of hardware to work successfully too. It sounds like magic. It sounds like it’s too good to be true, but there are actually some sensors onboard our smartphones that do the hard work. Geofences are just virtual perimeters that work off low-ambient wifi and cell tower data. They should not rely solely on GPS (Global Positioning System). If this is the core location data provider your user’s devices will suffer horrific battery drain resulting in your app being deleted. We have a post called “The buyer’s guide to geofencing software” that provides a checklist of what to watch out for when purchasing software from geofencing companies. There is absolutely no hardware required to create a geofence. Geo-fences have nothing to do with iBeacons. Think of your business on, let’s say, a Google Map. You would use a geofence marketing product, something similar to Pulsate Locate™ to do your geofencing. We’ve made a quick video that shows you how to define the virtual area that you wish to monitor. As customers enter this location, you have got the option to engage with them or simply monitor their behavior for business intelligence purposes. There are two different levels. There’s the radial stuff, which is a little bit bigger, a little bit broader and polygonal as about getting down into very, very granular zones. Most geofencing solutions use a radial fence, but they’re a little bit limited. For more flexibility a polygonal shape can be used. You might want to zoom in and focus on one specific business or a specific part of your business. You may just want to geo-fence your own location and find that on a map. Perhaps you don’t want to get passers-by but instead, monitor your competitor locations. You don’t want to get surrounding areas. You just want to zone right in. HOW DOES IT WORK WITH YOUR APP? Let me give you an example. Dave is a user of your app, he’s in close proximity to your location, perhaps you are a retailer or store owner and you want to message Dave when he enters your premises. Dave has downloaded your app onto the device. For Geofencing to work correctly, usually your app will need to have an integrated SDK or plugin. If you to try and build this all into your own mobile app from scratch, it’s going to be a lot of work, so chances are you’re hiring some other product or plugin to do this for you. Let’s get back to Dave and your app. You integrated the geofencing SDK into the app, once integrated, this SDK or plugin begins manipulating and reading data from sensors that are onboard the smartphone. You begin to recognize and understand Dave’s behaviors, habits and when he is nearby. Using signals from cell towers and different Wi-Fi networks in the surrounding area we begin to map out Dave’s current location and movements. And all of this is done using a very low power approach. Now that you understand the underlying technology behind monitoring app behavior or for when customers have shown up in your premises in the real world, you probably want to do something to engage with them. Perhaps you want to send them an offer. Maybe to increase foot traffic into your business. That’s when push notifications come into play. To start sending push notifications you will require some type of a push notification service to send a helpful reminder when the customer is in the area. The next step up from this is using some sort of mobile marketing CMS, so that you’re reaching out and engaging with customers not only at the right time, but to have a platform to maintain the offers, the vouchers, the coupons and the messages. 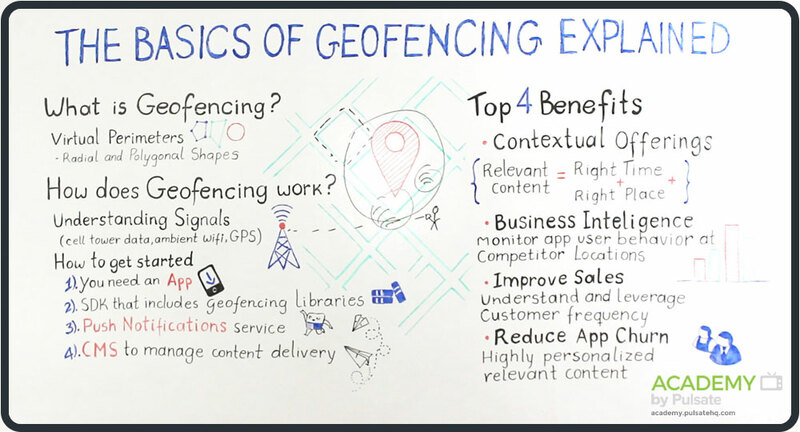 WHAT ARE THE TOP 4 BENEFITS OF GEOFENCING? 1. Contextual: Being relevant in 2016, in the world when customers show up at that right time and the right place, it’s about having something to say, that’s incredibly relevant, and you do this by being contextual. Geo-fences are a great way to be contextual. 2. Business intelligence: The places that you show up in the physical world, create inferences around your interests and what kind of a person you are. There’s great BI and MI that can come out of this. Of course, there’s the analysis of competitor locations. Reveal which customers are loyal that also frequent our competitors. 3. Increase revenue: You can use geofencing of course, to improve revenue and sales cycles by bringing people into your location, and understand then leverage the customer frequency and combine it with the competitive data. 4. Reduce app churn: Lastly, we can improve app user churn. When we engage customers based uniquely on their own context it makes your app seems like it has a higher utility value. That’s it, my video on the benefits of geofencing and tips to get you started. The basics. I invite you to take a look at my next video, which you can do so by clicking the link below, and I’m going to be giving you a checklist.